After the wedding, everyone headed over to Luanne’s parent’s home for the reception. There was a polka band and lots of people dancing in big circles with their arms linked together. Lot’s of laughing and talking and singing and great food and lots to drink. I remember asking someone how long the reception lasted. And the reply was, “till the booze runs out.” Deb and I lasted a day and a half and were accused of being party poopers for leaving so early. We later learned that we only made it half way through. The village of Cana in Galilee was the next village over from the village of Nazareth in Galilee where Mary and Jesus live. John tells us that Mary was there and Jesus was invited along with His disciples. I don’t know what you’re image of Jesus is, always serious or even sad or mad. But as you read the gospels it becomes pretty obvious that our Lord loved to share in the joy of life together. Jesus never counted it a sin to be happy or to have fun. So if you want, it’s perfectly alright to picture Jesus dancing the polka and doing the ‘chicken dance’ and some ‘Texas line dancing’ along with everyone else at this wedding reception in Cana. I want to pause here for just a moment to comment on this whole business of the connection between weddings and joy and celebration. Historically, weddings have universally been recognized as times of great joy and celebration. Which is a ‘carry forward’ from the joy that God had when He brought Eve to Adam and married them in the Garden of Eden in the beginning. It’s a part of being made in the image of God. But today, there are some weddings that frankly, we have a hard time summoning up true feelings of joy and that, just as frankly, we can’t truly celebrate. Listen, I can’t tell you if you should or shouldn’t attend the ceremony. You have to use your own judgement there. But what I can tell you that when God’s design for marriage is redesigned, it’s too much to ask the believer to be joyful? It’s too much to expect the believer to celebrate it? Back to the wedding reception in Cana of Galilee. One place where some of you might be able to connect to a middle-eastern village wedding is in the fact that it takes a lot of preparation. You don’t just invite the whole village over for a week long party without lots of advanced planning and preparation. Later, Jesus would tell a parable about a man who invited his village to his wedding reception. And after counting those who said they would come, he slaughtered the necessary number of animals for the banquet. But at the last minute, a lot of folks made excuses for why they couldn’t attend. In a day before refrigeration, what about all that meat that would spoil? Here, at this wedding in Cana, the problem is just the opposite. The groom has UNDERESTIMATED the amount of wine his guest would drink, and the wine ran out. The issue for the newlyweds goes way beyond just ‘embarrassing.’ This is not like coming up a few stuffed chicken breasts short. This is shameful in a way that’s hard for us to understand because we’d just have some more delivered in. For some reason, the servants make their way to Mary and tell her the problem, which strongly suggests that Mary is a part of this family and has some authority here. Mary turns to her son and says, “they have no wine.” We wonder what she was thinking? What did she expect Him to do? Much later, as He is hanging from the cross it will be the same. Jesus will point to John and say to Mary, “Woman, behold you son.” Three days before this wedding, Jesus had been baptized and His ministry had officially begun. He is His mother’s Lord and Savior and the Son of God before His mother’s son. John tells us what those stone water jars were used for. The Jewish ‘rite of purification’ was kind of like our saying grace before we eat. Before eating you held one hand outside the rim of the jar and splashed water onto it with the other hand. And then switched and washed the other hand. 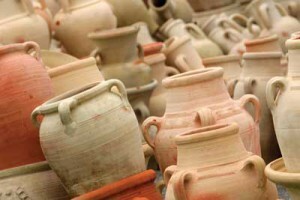 Wine was stored in skins, not in stone jars. But Jesus directs the servants to “fill the jars with water.” You would think that Jesus would have told the servants to fill the ‘wine skins’ with water. By the response of the “master of the feast,” it sure wouldn’t have been the first time the hosts watered down the wine to make it stretch farther. But Mary said, “Do whatever He says.” And they do. Now we come to the real drama in this account. The “master of the feast” doesn’t know what has just taken place. We do. The servants do. But the guy whom the bridegroom had put in charge of running the show doesn’t know. But this much he knows – THIS IS REALLY GOOD WINE! In fact, this is much better than the wine the wine they had been drinking. And the wonderful irony here is that HE THINKS THAT THIS IS ALL PART OF THE BRIDE AND GROOM’S PLAN. He thinks it’s intentional on their part, and he credits them for their amazing hospitality. “Everyone serves the good wine first, and when people have drunk freely, then the poor wine. But you have kept the good wine until now.” They’ve gone overboard for the village. They were on the verge of being terribly embarrassed and ashamed in front of the whole village. But now they’re lavishly praised in front of all of their guests. AND WHAT ABOUT THE BRIDE AND GROOM? What were they thinking? They knew that they had NOT PLANNED THIS. And whatever was going on, they knew that all this praise that was being lavished on them was completely undeserved. And it’s right here where this account becomes the picture of the grace and love of God that Jesus has come into the world to accomplish. And we’re in this picture. But Jesus speaks His Word into our emptiness, and turns our shame and rejection into joy and celebration. And we hear our Lord say to us, “well done good and faithful servant.” And we are dumbfounded because we know that we haven’t done anything. Jesus never does ‘miracles’ for the sake of doing a ‘miracle.’ ‘Miracles’ are always ‘signs’ that point to something else – and that something else is the glory of the divinity of Jesus Christ and the joy and celebration of the new life He has come to give us. John he concludes his gospel saying, “Jesus did many other signs in the presence of the disciples, which are not written in this book, but these are written so that you might believe that Jesus is the Christ, the Son of God, and by believing, you may have life in His name.” (John 20:30-31). The fact that John opens this account by telling us that this happened on the 3rd day is enough to alert us that God is about to uncork something very special for His beloved bride. He has been pouring out His salvation and grace on His people from the first day that men and women needed saving. But now we see that He has saved the best wine for last. Because there is no wine in this world that is able to produce the kind of joy that our Bridegroom desires for His beloved bride, He pours out a wine that gives the deep joy of forgiveness for all of your sins, and a seat at the eternal wedding banquet in heaven. As we drink this finest of wines that ‘purifies’ us completely, and inebriates us with the Holy Spirit, we are filled with deep joy and genuine celebration.